We’d love your help. Let us know what’s wrong with this preview of The Satin Man by Alan Whiticker. On Australia Day 1966, the Beaumont children - Jane, Arna and Grant - disappeared from an Adelaide beach. Despite a large-scale police investigation and extensive media coverage, the case remains unsolved, bogged down by false leads and dead ends, an the Beaumont children were never seen again. In 2006, author Alan Whiticker, assisted by researcher Stuart Mullins, wrote the On Australia Day 1966, the Beaumont children - Jane, Arna and Grant - disappeared from an Adelaide beach. Despite a large-scale police investigation and extensive media coverage, the case remains unsolved, bogged down by false leads and dead ends, an the Beaumont children were never seen again. In 2006, author Alan Whiticker, assisted by researcher Stuart Mullins, wrote the definitive account of the sibling's disappearance in Searching For The Beaumont Children. Since the publication of that book, fresh leads have been sceptically received, until one family in particular presented a remarkabl possibility - that their family patriarch, a man with a peculiar predilection for satin, might have been involved. To ask other readers questions about The Satin Man, please sign up. Open question here... I have for a long time believed there should be a statue/monument erected in Colley Reserve in memory of the three children lost that day in 1966. Like the monument I understand is in Nagasaki, erected in memory of the little girl who made the paper cranes, it could be an international icon to come and remember and pay respects to the rights of children to safety everywhere. Others thoughts? I would love to read this but it doesn't seem to be available anywhere. I am in Canada :( Is there any place to get it? Stuart Mullins Also try New Holland Publishers Sydney they will have some however they sold out first lot quite quickly ..
Major Crime detectives have formally admitted Harry Phipps was not a suspect in the case and allegations implicating him had been investigated and discounted. Respectable writers of true crime need a judicious researcher who is capable of finding the truth, one without intent on crucifying the dead who cannot speak from their graves. They need a private detective who’s experienced in Major Crime; one who Major Crime detectives have formally admitted Harry Phipps was not a suspect in the case and allegations implicating him had been investigated and discounted. It is a despicable act to hear another deceptive account based on hearsay and inferences of what appears to be a small revengeful group with rancorous scruples. The smear campaign is a great tragedy, not only for Harry Phipps and many of his family members who cannot speak from their graves, but more importantly for Grant and Nancy Beaumont. They have endured years of pain and tolerated too many hoax stories from people who don’t have a moral compass and conscience. I find the media attention and writing by Alan Whiticker and researcher, Stuart Mullins contemptible. Book sales of crime, void of substance and core evidence, should never exceed the importance of falsely accusing and incriminating innocent people. Shame on all involved in rumours, innuendos and lies. Authenticity and integrity shall always triumph over repugnant fabrications. In his previous book Searching For The Beaumont Children: Australia's Most Famous Unsolved Mystery, auth Like most Australians I have always been fascinated with the mystery of what happened to the Beaumont children on Australia Day 1966. How was it possible that three children could be abducted in broad daylight on a crowded beach in Adelaide and simply disappear without a trace? Despite many theories being floated in the almost 50 years since, there has never been any kind of definitive answer. Tundra I was happy to read your review even with the spoiler alert because it is clearly not worth wasting my time on. Catherine Davison Thanks Tundra, definitely not worth the time, it’s on a par with an A Current Affair story. Interesting reading - a few possibilities put forward. It may be that this disappearance will never be solved I guess. This book didn't have an awful lot to add to Alan J. Whiticker's 'Searching for the Beaumont Children'. If you haven't read that book, just skip straight to this one, which re-caps the story told in the previous book, interspersed with chapters which deal with the authors' new leads. It would be wonderful if the SA Police re-opened the case based on this evidence, even if nothing comes of it. Well written and researched. Definitely some interesting theories about a cold case that has haunted Australian consciousness for the past fifty years. Even if the 'Satin man' has nothing to do with this crime, the allegations about him by his son were reprehensible enough. Well researched by one of Australia's leading crime authors. Highly recommend, five stars. Too similar to the other book about the Beaumont children. Only half of the book is about a family obviously with issues and writing style is ordinary. On Australia Day 1966, the Beaumont children Jane, Arnna and Grant disappeared from Glenelg an Adelaide beach. Despite a large scale police investigation and extensive media coverage, the case remains unsolved to this day. I was 12 years old when the children were abducted and like many thousands in Australia it is one missing persons case that never leaves you. This book discusses a new theory but still has not resolved the case. A little repetitive at times, but in all a good read. This review has been hidden because it contains spoilers. To view it, click here. 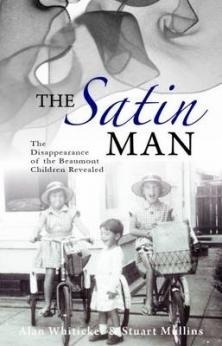 This is the best book that I’ve seen about the disappearance of the Beaumont children. With the evidence that’s present in this book SAPOL should dig the whole area where the sand pit used to be. The Beaumont children are probably buried there. Very compelling book. An interesting new insight into one of Australia's biggest mysteries! A detailed and interesting account of the Beaumont children's disappearance, peppered with theory and speculation as to "whodunnit?" Would have been nice to have had some of the serious allegations investigated practically, as the author seems to think they can point to a place with hard facts and evidence, but hasn't followed them up. Interesting enough if you know little about the case. Because the Beaumont children disappeared when I was a young girl in the same city this story held special significance...however what is written, although extremely plausible, is not proven in court....so I am still sceptical as well as intrigued by the subject. Very fascinating book. Hopefully one day the case is solved. Dreadful read. Sounds far fetched to me. Interesting retread of the Beaumont children mystery, but the book is underpinned by an unconvincing theory that mirrors the false leads and dead ends the book discusses. A random pick up from the library that ended up being quite fascinating. Let's hope people take notice and justice can be finally done.